Click on any photo for a large format version. For promotional use only. Laughter is healthy, various scientific studies show. Not laughing - or rather, not making audiences laugh - is detrimental, at least to Paul Simmons. Simmons, a member of local comedy improvisational troupe Einstein Simplified, sees his group as an outlet - for both the audience members and the guys on stage. He’s been doing it since helping found the group in 1994, and he’s the sole remaining original member. Friday night, Einstein Simplified returns to Rockford for the second of its monthly shows at the new Riverside Business and Events Center. The first show was well-received, Simmons said, but sparsely attended. Not that it matters, since over his 17 years with the troupe, he’s played everything from almost-empty rooms to a full auditorium of nearly 1,400 people for a private event at the Clayton Center for the Arts. The size of the crowd doesn’t really matter to the quality of an Einstein Simplifed show - but the crowd’s enthusiasm certainly does. The way Einstein Simplified works is reminiscent of the old ABC-TV show “Whose Line Is It, Anyway?,” or the relatively new “Drew Carey’s Improv-a-Ganza,” which airs on the Game Show Network. It’s improvisational comedy, where the group works from unscripted material in the form of games, skits, scenes, musical montages and monologues. Many comedy fans are probably more familiar with sketch comedy (scripted scenes a la “Saturday Night Live”) or stand-up comedy (one-person comedy shows where the comic entertains the audience with prepared material). The members of Einstein Simplified perform short-form improv, a series of games or sketches 6-8 minutes in length based on suggestions taken from the audience. It’s a risk, because the audience suggestions can often lack flair, or the sketch can come crashing down to earth without eliciting any laughs. But when it works, it really works, Simmons said. “What’s funny are the games where we mess up,” he said. “This Tuesday (the group performs every Tuesday at Side Splitters Comedy Club in West Knoxville), we were doing the Alphabet Game, which is basically letter replacement - the letter R becomes a T, so ‘carrot’ becomes ‘cattot,’ or ‘finget’ for ‘finger,’ and they have to have a conversation like that. Relying on the unpredictability of the audience for suggestions is where the fun comes from. Take, for example, the game “Authors” - four troupe members narrate a story or book in the style of a different author that the audience suggests. After another suggestion for a book title, each of the players has to narrate their portion of the book ... in character. Which means, for example, that four actors playing the parts of Mark Twain, Danielle Steel, a writer for the magazine Boy’s Life and Anton LaVey (who wrote the Satanic Bible) are required to improvise off the tops of their head a story based on a title that an audience member suggests. Needless to say, there aren’t words to describe it. “Wacky,” “crazy,” “insane,” “hysterical” - they all fit, but they don’t do the show justice. And given the group’s dedication to keeping the humor tilted toward the witty and the obscure rather than sophomoric or juvenile, it’s also smart comedy, so add “intellectual” to that list of adjectives as well. Or, you could just call it what it is - “funny” - and give it a try for yourself. “We’ve performed all over the place and for all age ranges,” Simmons said. “We’ve played a PTA meeting with the first- through third-graders there, and it was a great time - easiest guessing games ever. And there’s something new every week. There will be hysterical, hit-the-table-hard moments every week. KNOXVILLE - After holding the Tuesday night slot at Patrick Sullivan's for eight years, local improvisational comedy troupe Einstein Simplified is moving their weekly show to the Square Room on Aug. 31. Einstein Simplified has performed their short-form comedy - similar to the TV show "Whose Line is it Anyway?" - in the Old City since their formation in 1994, bouncing between Manhattan's and Patrick Sullivan's multiple times. This year the group performed in Market Square as part of Knoxville's First Night and at the Square Room in June as part of the International Biscuit Festival. This soon prompted their invitation to hold the Square Room's Tuesday night slot. They accepted, given their successful shows at both events. "All this room does is put on shows," group member Michael Richardson says of the Square Room. The Square Room is a performance-centered venue. It has a larger capacity than the group's recent home in Sullivan's third floor Great Hall and a more extensive sound system (with more microphones) since the majority of the venue's shows consist of live music. "It comes with all sorts of bells and whistles," member Paul Simmons adds, pointing out the dual projector screens on either side of the stage. The group says this will allow them to incorporate new aspects into the show. Troupe member Frank Murphy explained that the TV screens and high-quality PA system might allow them to introduce a game where two performers narrate dialogue over video clips, whereas Sullivan's setup didn't provide them with such an opportunity. These factors lead the group to believe that the space is a better fit for them than at Patrick Sullivan's. They point out they aren't bailing on the Old City so much as they're "changing tracks," as Murphy says. The group's decision to move comes just months after the closing of Manhattan's, which they speculate has led to a decline in foot traffic in the Old City. Richardson says that at their Patrick Sullivan's shows, the crowd was there specifically to see them. "We have regulars who have been coming for over eight years," he says. Because their act rarely repeats jokes and most of it is made up on the spot, audience members can return to performances and essentially see a new show. Although the group says there hasn't been any change in their crowd size, they feel the move to the Square Room might increase their crowd due to the popularity of Market Square. "This is a happening place," Richardson says of Market Square. The group feels like there isn't as much bar-hopping action in the Old City like there used to be, and people from outside of the downtown area might be more likely to head to Market Square. Before relocating to Market Square, Einstein Simplified polled their fans and met with a positive response. Richardson, Simmons, and Murphy all state that they're excited about moving to the Square Room, and they believe it will benefit both the group and their audience. The move roughly coincides with the group's 16th anniversary on Aug. 22 (their last date at Patrick Sullivan's was Aug. 24). "Now that the group can drive, we're leaving for Market Square!" Simmons quips. The shows will continue to be "free to get in, but you have to pay to leave," Murphy says. The troupe collects tips as people leave the venue after a performance. 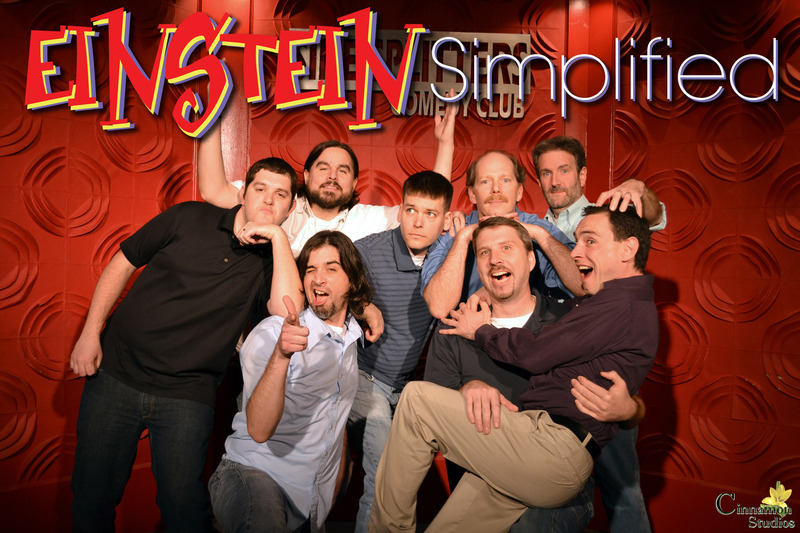 Einstein Simplified, a male improvisational group, has been relentlessly causing uproars of laughter in the Knoxville, Tenn. area for over 17 years now. Although the group has created a quick and witty reputation for themselves in Knoxville's comedy realm over the years, monotony is something that Einstein Simplified audiences should not expect to see when attending a show. On Tuesday nights, Einstein Simplified improvisational group gathers to entertain Knoxvillians in Market Square. After performing at the Square Room for six months, the group has decided to relocate their Tuesday night shows to Side Splitters Comedy Club in West Knoxville. Einstein Simplified first began performing in Knoxville in August 1994. Paul Simmons, who is the last original members of the crew, said he learned about the group by reading through a local newspaper. "There was an ad in the Metro Pulse saying 'Are you funny? Call!' and then I did," Simmons said. 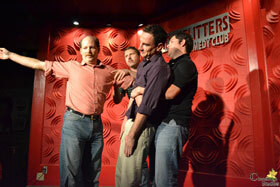 In the beginning, the improv group began performing at open mic nights at Manhattan's Club in Knoxville's Old City. "After performing several open mic nights at Manhattan's, we were then given 15 minute opening acts and then that developed into our own night," Simmons said. Another member of the company, Frank Murphy, learned about Einstein Simplified when he moved to Knoxville in April 2002. "I Googled 'improv' and then this popped up," Murphy said. 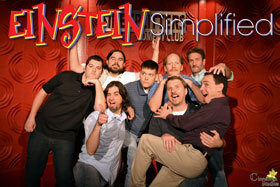 Einstein Simplified has evolved into a group of eight to nine men that rotate each week. The host is also rotated week by week so that no variable of the group goes unchanged. "None of us want to be the host because then we don't get to perform, so we rotate by last names so that everyone has a chance," Murphy said. 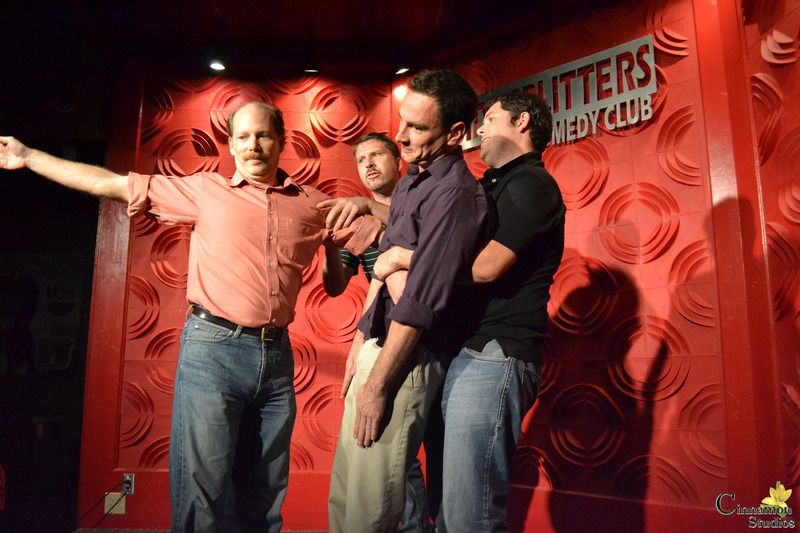 Einstein Simplified is an improv show that is constantly evolving with no two shows the same. The group performs more than 100 games and does approximately 20 games per show. "We get ideas from improv shows and make up our own," Murphy said. As charitable as they are funny, Einstein Simplified donated all of their tips and donations from their March 1 performance to Second Harvest Food Bank in Knoxville. Earlier this week, the food bank flooded, causing over $100,000 worth of damages. "It's like recess time on the stage, unlike stand-up comedy," performer Dave Fennell said. The group is not to be confused with your everyday stand-up comedy show. In fact, it is important to know that improv is much different than stand up comedy. "Stand up comedy starts as a large amount of material and it is then whittled down to a short set. In improv you do the opposite, you start with this little germ of an idea from something the audience shouts out and then you build on it and build on it, and then stop when you get to the big punch line," Murphy said. Einstein Simplified is most often compared to the well-known television show "Who's Line Is It Anyway?" Although the show is a great reference for someone who has never been to an Einstein Simplified show, Fennell says Who's Line is "just like us... but un-funny." 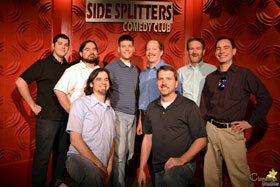 Einstein Simplified performs on Tuesday nights at 8 p.m. at Side Splitters Comedy Club at 9246 Park West Blvd. Tickets are generally $5 plus tax.